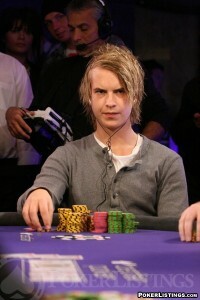 One of the most discussed topics in online poker has been the identity of the new high-stakes phenom on Full Tilt Poker who uses the alias Isildur1: Million dollar pots and multi-million dollar swings have become the norm since this mystery man from Sweden showed up at the nosebleed tables on Full Tilt Poker, and it now seems the online poker community has its answer –or perhaps more precisely, confirmation. Antanas Gouga, better known as Tony G in the poker world, made a recent blog entry where he says he can reveal that Isildur1 is Viktor Blum: A rumor that was first reported by PokerNewsBoy some weeks ago. There seems to be a consensus amongst anyone who has sat at the tables with Viktor that he is one of the best in the world: So it will be interesting to see if the “outing” will change people’s perception of his skills or will hinder his action at the tables. If he is as good as people believe, knowing who you’re playing may not help his opponents all that much. This entry was posted on Friday, November 27th, 2009 at 2:25 pm and is filed under Poker News. You can follow any responses to this entry through the RSS 2.0 feed. You can leave a response, or trackback from your own site.